What do you say to a state which is on a dream run? The state’s tourism is promoted by Amitabh Bachchan, its infrastructure for the automobile industry is geared towards making it the Detroit of India and now the state has launched Asia’a largest solar park. Yes, we’re talking about Gujarat. As a part of the Swarnim Gujarat celebrations, the Solar Park has been launched at Charanka village, Santalpur taluka in Patan district. 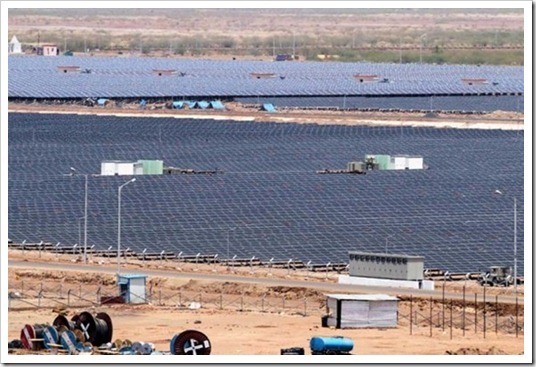 This patch of desert was hitherto unutilized and completely barren has now been adorned with the solar park which will yield invaluable benefits to the state, the nations and the coming generations. The park spread over 3000 acres of wasteland, is expected to produce 600 MW of valuable energy is being expected to be generated. The Modi Government sees lots of indirect benefits of this park. In addition to solar energy, the park will also manufacture solar power plant panels and other related equipment. And secondly, local people of Gujarat will be trained to work at solar parks. An area that no one was ready to visit before is now attracting big companies to set up base. The good news is that the solar park will produce 214 MW of photovoltaic solar capacity, making it larger than Golmud Solar Park in China that has a capacity of 200 MW, ET reported. Narendra Modi, CM of Gujarat proudly announced via his Twitter account "Gujarat dedicates 600 MW of solar power to the nation today. We are celebrating the launch of Agni V & dedication of 600 MW solar power park in Gujarat." It is expected to generate two thirds of India’s total 900 MW solar power production. It is expected to reduce carbon dioxide emissions to 8 million tonnes and save 900,000 tonnes of natural gas annually. By 2013, India aims for solar power to account for 3 percent of total national capacity and the nation wants renewable sources of energy to rise from the current 6 percent capacity to a whopping 15 percent of capacity by 2020. The Modi Government had signed MoUs for the generation of 968.5 MW of solar power by the end of 2012, under its Solar Power Policy. The Modi Government has stated that it will be developing other such projects at towns like Anand, Banaskantha, Jamnangar, Junagadh, Kutch, Porbandar, Rajkot, Surat and Surendranagar within Gujarat. The Daily Bhaskar reported way back in 2010 that the Gujarat Government had already given land allotment letters to 15 companies which include Azure Power, GMR Energy and GSPC Pipavav Power Company. These companies will be setting up solar power plants in the park. Similarly, the State Government wants to promote solar installations for which it has allocated developed land to project developers. Back in 2010, CM Modi had expressed his intentions of developing Charanka as the Swarnim Surya Tirth (Golden Sun Pilgrimage), owing to the abundance of solar energy available there. He had also expressed his wish for a Sun Temple to be built in the area, along with a lake. International media have viewed this step as ‘a serious boost’ to India’s renewable energy ambitions, Washington Post stated. So while other states bicker amongst themselves for natural resources, is Gujarat on its way to fast track progress? With Ahmadabad being pegged as the newly booming metro of Gujarat and the state generating highly congenial atmosphere for industry and employment, chances are the Narendra Modi will leave no stone unturned to make Gujarat amongst the most developed states in India. Other states need to step up… Don’t they? Although the project is big & attractive the cost per unit to consumer without any govt. subsidies is a main factor for viability of project. therefore this cost should be announced along with the advertisement of the project. How much electricity will be available per sq. meter of land per day? If we can avail 600MW from this project alone why we need nuclear plants? Is there any one can give ROI comparisons between this two source of energy. This is what exactly needs to be done in large scale in India, We should leave the natural resources for our successors. Every state should initiate this kind of activity leaving natural resources to make the environmental balance. utilize the sun power more. I have been trying to start a small scale, but never able to get detailed information. Narendra Modi is doing a great job and yet he is the target of hate campaign by a large number of political parties and social groups! Just Great. Something we all Indians should be Proud About. well Done Gujrat. This is a great example of India using what it has on a large scale. But what about solar panels for the average household. In the UK we had subsidies to entice households to effectly mortgage their roofs for free panels and electricity with the surplus going back to the grid. This has since stopped as the government coffers are in a sorry state (the western economies finding it difficult to get out of recession). Could such a project be viable in India – does it already exist? Good Work Mr.Modi. This Should be follow by all State and Importantly the Central Govt. Tamil Nadu Govt should take steps to reduce power scarcity. By this only constrain Gujarat is being attracted by more investment. That's MODI GOVERMENT, JAI GUJARAT My CONGRATULATIONS to Mr. Narendra Modi for bringing GUJARAT once more in the world map. This is really a awesome work done by the government.In coming future it play really a alternative backup for our natural resources.. This is really great work being done by the Gujarat government. Certainly other state do need to catch up with Gujarat. There is a huge potential for such a developments in the Deccan plateau.